The Universal Cloud and Aerosol Sounding System (UCASS) is a low-cost miniature Optical Particle Counter (OPC) capable of sizing particles in the size range 0.4-40microns. The open geometry design makes the instrument suitable for deployment on balloon-borne sounding systems, dropsonde systems or as part of a Unmanned Aerial Vehicle (UAV). Laboratory and field experiments show good agreement to reference instruments in a range of cloudy and dusty environments. The Filter Inlet for Gases and AEROsols (FIGAERO) is an inlet designed to be coupled with a high-resolution time-of-flight chemical ionization mass spectrometer (HR-ToF-CIMS) and provides simultaneous molecular information relating to both the gas- and particle-phase samples. This method has been used to extract vapour pressures of compounds whilst giving quantitative concentrations in the particle phase. Here we detail an ideal set of benchmark compounds for characterization of the FIGAERO. Optical array probe measurements of clouds are widely used to inform and validate numerical weather and climate models. In this paper, we discuss artefacts which may bias data from these instruments. Using laboratory and synthetic datasets, we demonstrate how greyscale analysis can be used to filter data, constraining the sample volume, and improving data quality particularly at small sizes where their measurements are considered unreliable. The AER-D airborne campaign characterised Saharan dust in the eastern Atlantic. We report an instance of unusual vertical structure of the Saharan Air Layer during an intense event, showing a large radiative impact and correlated with anomalous lightning activity. Moreover, we report a significant presence of giant dust particles. This is important because most models would miss the giant particles. 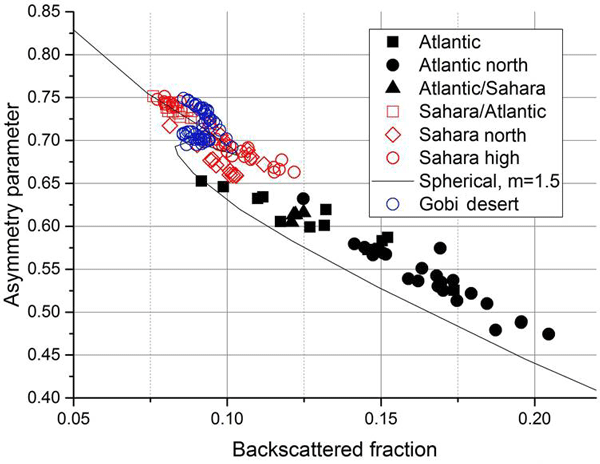 Our findings may change the way we represent dust transport and deposition in the Atlantic. Every year, millions of tons of Saharan dust particles are carried across the Atlantic by the wind, where they can affect weather patterns and climate. Their sizes span orders of magnitude, but the largest (over 10 microns – around the width of a human hair) are difficult to measure and few observations exist. Here we show new aircraft observations of large dust particles, finding more than we would expect, and we quantify their properties which allow them to interact with atmospheric radiation. The work deals with cold weather outbreaks at high latitudes that often bring severe weather such as heavy snow, lightning and high winds but are poorly forecast by weather models. Here we made measurements of these events and the clouds associated with them using a research aircraft. We found that the properties of these clouds were often very different to what the models predicted, and these results can potentially be used to bring significant improvement to the forecasting of these events. Pollen, bacteria and fungal spores are common in the environment, can have very important implications for public health and may influence the weather. Biological sensors potentially could be used to monitor quantities of these types of particles. However, it is important to transform the measurements from these instruments into counts of these biological particles. The paper tests a variety of approaches for achieving this aim on data collected in a laboratory. Co-condensation of inorganic or organic vapours on growing droplets could significantly enhance both CCN and cloud droplet number concentration, thereby influencing climate. Until now, there has been very few direct observational evidence of this process. We exposed involatile inorganic particles to a moist atmosphere containing a controlled amount of an organic semi-volatile vapour. We measured a much greater growth of the particles than if they had only been exposed to water vapour. This paper presents a new method to assess inventory estimates of greenhouse gas and air pollutant emissions for large cities. A case study using data sampled by a research aircraft around London was used to test the method. We found that the UK national inventory agrees with our observations for CO, but needed lower emissions for CH4 to agree with the measured data. Repeated studies could help determine how these emissions vary on different timescales. This paper utilizes a chemical ionisation mass spectrometer measuring gas and particle-phase organosulfates (OS) simultaneously during a field campaign in Beijing, China, and highlights how high time frequency online measurements enable a detailed analysis of dominant production mechanisms. We find that high aerosol acidity, organic precursor concentration and relative humidity promote the production of OS. The thermogram desorption reveals the potential for semi-volatile gas-phase OS. This article presents measurements of aerosol properties off the coast of west Africa during August 2015. For the first time, an airborne laser-induced incandescence instrument was deployed to measure the hematite content of dust. The single scattering albedo of dust was found to be influenced by the hematite content, but depended on the dust source and potential dust age. This highlights the importance of size-dependent composition in determining the optical properties of dust. Particulate matter (PM) chemical composition includes thousands of individual organic compounds that have never been tested for their toxicological potential. Computational (in silico) screenings represent a promising approach to identify new target compounds for more in-depth toxicological analyses. We provide here a proof-of-concept evaluation based on ca. 100 aerosol organic compounds. Reliable toxicological predictions were obtained for more than 80 % of them. 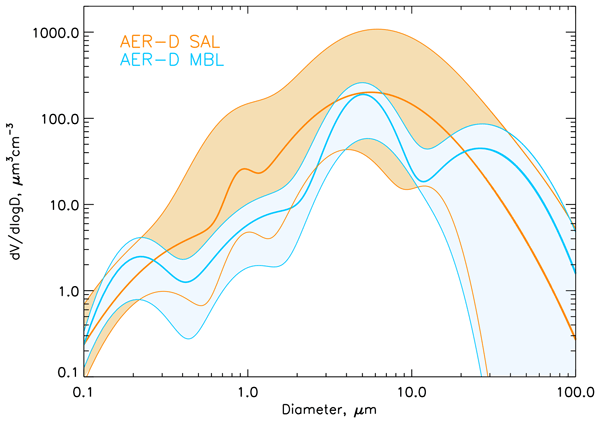 This is the first time the Maxwell–Stefan framework has been applied to an atmospheric aerosol core–shell model and shows that there is a complex interplay between the viscous and solubility effects on aerosol composition. 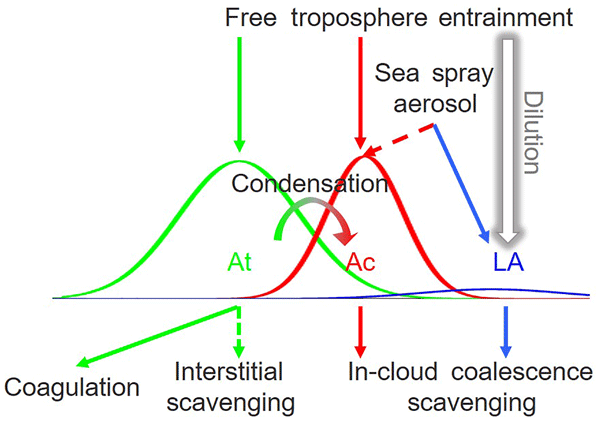 Understanding aerosol composition is essential to accurately model their interactions within atmospheric systems. We use simple binary systems to demonstrate how viscosity and solubility both play a role in affecting the rate of diffusion through aerosol particles. 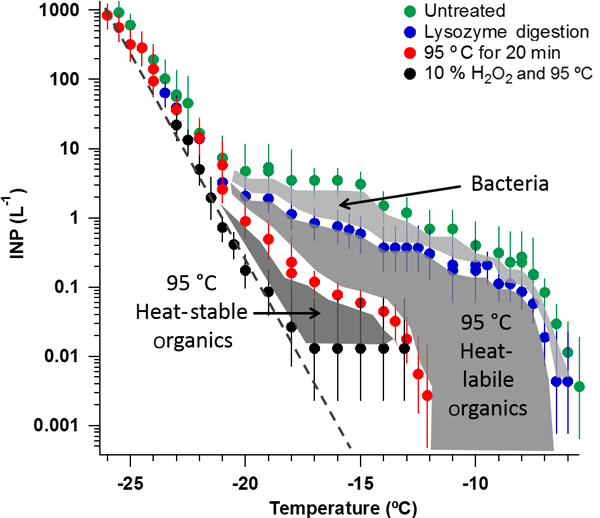 We present the first real-time detection of bioparticles on the Antarctic continent using a novel UV-LIF technique. The high time resolution of the technique allowed us to examine the relationships between bioparticle concentrations and airmass history and local winds, which would not have been possible with conventional high-volume filter sampling techniques. We also show evidence of episodic long-range transport of pollen from coastal South America to the continent. Few direct measurements have been made of Antarctic cloud and aerosol properties. 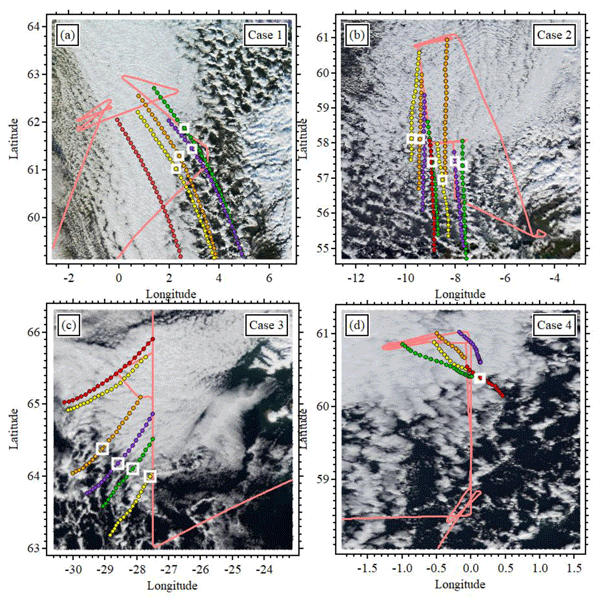 As part of the 2015 Microphysics of Antarctic Clouds (MAC) field campaign, detailed airborne and ground-based measurements were made over the Weddell Sea and Antarctic coastal continent. This paper presents the first results from this campaign and discusses the cloud properties and processes important in this region. Hydroxyl radical reactivity (k(OH)) is closely related to processes that lead to the formation of oxidised, secondary pollutants such as ozone and aerosol. In order to compare the performances of instruments measuring k(OH), experiments were conducted in the simulation chamber SAPHIR. Chemical conditions were chosen either to be representative of the atmosphere or to test potential limitations of instruments. Overall, the results show that instruments are capable of measuring k(OH). 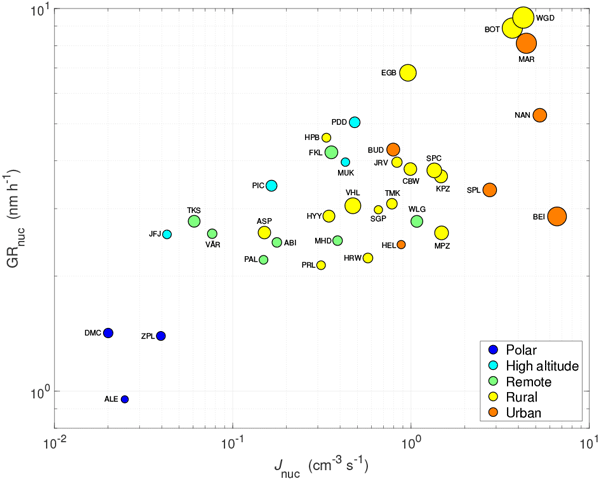 The paper presents 38 h of in situ cloud spectrometer observations of microphysical cloud properties in the Arctic, midlatitudes and tropics. The clouds are classified via particle concentrations, size distributions, and – as a novelty – small particle aspherical fractions. Cloud-type profiles are given for different temperatures and locations. The results confine regions where different cloud transformation processes occurred and emphasise the importance of small particle shape detection. To simulate particle-phase diffusion, an analytical expression is desired because it takes less calculation time than a differential equation. Here a correction is found for the analytical solution for when diffusivity is dependent on composition, thereby making it more widely applicable than before. 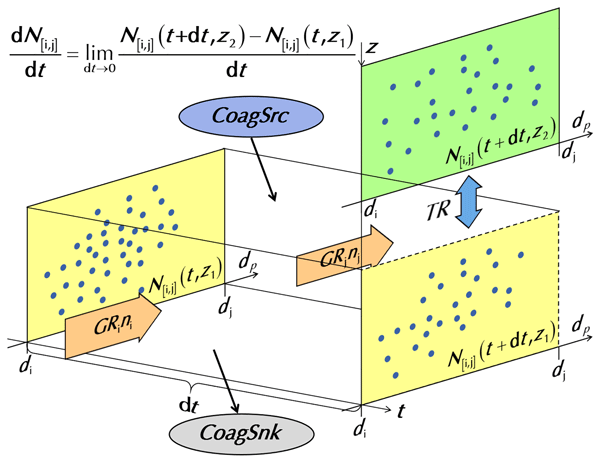 Consequently, we are able to more realistically evaluate the rate limitation (if any) imposed by particle-phase diffusion on component partitioning between the gas and particle phase. Our ability to model the chemical and thermodynamic processes that lead to secondary organic aerosol (SOA) formation is thought to be hampered by the complexity of the system. 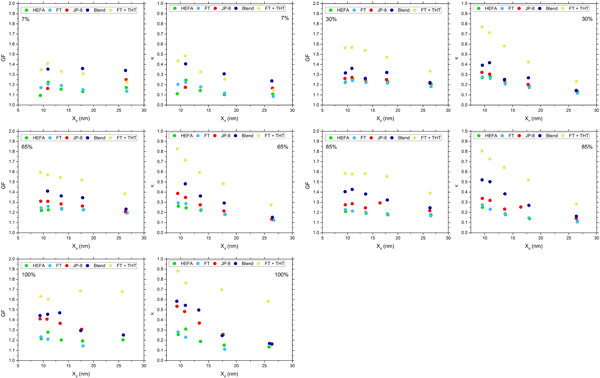 In this proof of concept study, the ability to train supervised methods to predict electron impact ionisation (EI) mass spectra for the AMS is evaluated to facilitate improved model evaluation. The study demonstrates the use of a methodology that would be improved with more training data and data from simple mixed systems. Particles such as bacteria, pollen and fungal spores have important implications within the environment and public health sectors. Here we evaluate the performance of various different methods for distinguishing between these different types of particles using a new instrument. We demonstrate that there may be better alternatives to the currently used methods which can be further investigated in future research. We present an analysis of bioaerosol measurements using two real-time fluorescence instruments in combination with molecular tracer techniques for quantifying airborne fungal spores in a semi-arid forest. Both techniques provide fungal spore concentrations of the order of 104 m−3 and up to 30 % of particle mass. 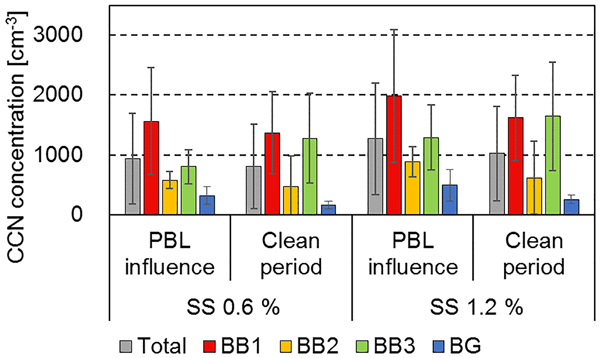 Rainy periods exhibited higher concentrations and stronger correlations between fluorescent bioparticle and molecular tracer measurements. Fungal culture results are also presented. We present a new mathematical formalism that serves to represent exchanges of inorganic matter between the atmosphere gas phase and the aerosol aqueous phase. In a global modelling framework, taking into account these processes may help represent many important features more accurately, such as the formation of cloud droplets or the radiative properties of the atmosphere. The formalism strives to keep an appropriate balance between accuracy and computation efficiency requirements. Semi-volatile compounds, like water, can exist in both vapour phases and condensed phases within a system. This paper presents a method of calculating the condensed and vapour phases of semi-volatile compounds at equilibrium, in particular, when the condensed mass occurs within particles of different sizes and chemical composition. The applications of interest to the authors are those of atmospheric importance such as cloud droplet formation and reflection or absorption of solar radiation. This article presents ambient air VOC measurements performed in Paris during the MEGAPOLI and FRANCIPOL campaigns (2010). For the first time, we report (O)VOC concentration levels, their temporal variations and their main emission sources. The originality of this study stands in using near-field observations to help strengthen the identification of apportioned sources derived from PMF. An important finding of this work is the high contribution of the wood burning source (50 %) in winter. 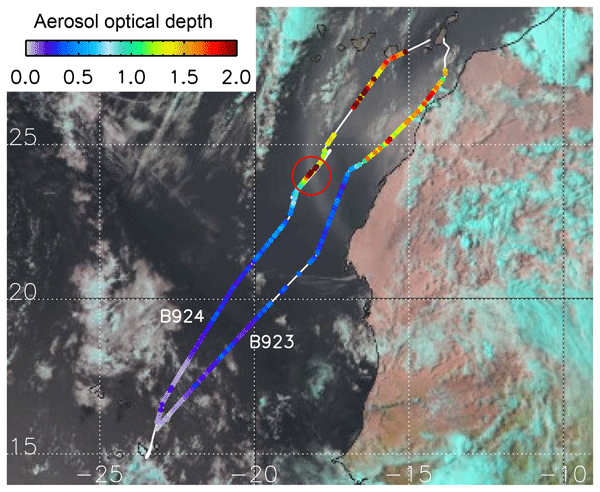 We present measurements of boundary layer aerosol concentration, size and composition from research flights performed over the southwest peninsula of the UK during the COnvective Precipitation Experiment (COPE) of summer 2013. We compare case studies of aerosol in cleaner marine air from the Atlantic with anthropogenic pollution from the UK. These measurements are then used to investigate the possible sources of CCN and IN in the region. 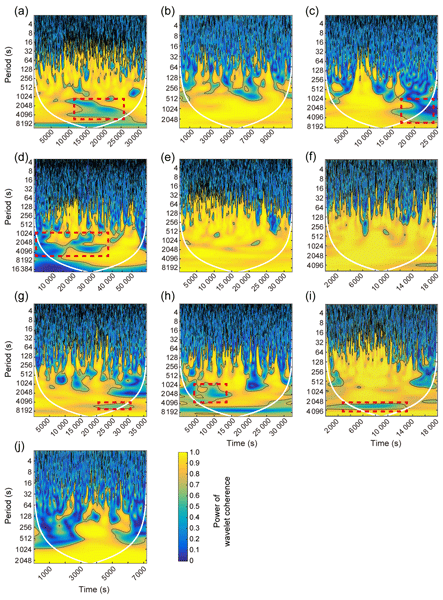 A novel inverse modelling framework is developed for analysing the sensitivity of cloud condensation nuclei (CCN) concentrations to simultaneous perturbations in multiple model parameters at atmospherically relevant humidities. 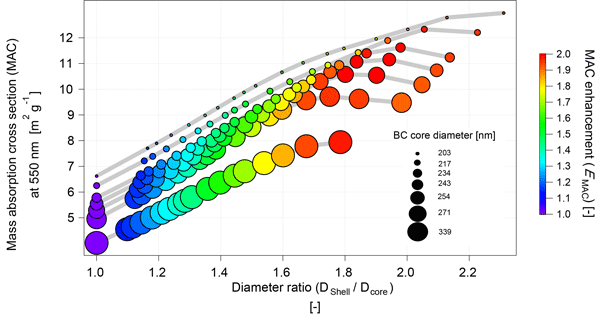 Many parameter interactions are identified and CCN concentrations are found to be relatively insensitive to bulk–surface partitioning, while aerosol concentration, surface tension, composition and solution ideality exhibit a higher degree of sensitivity. Dissolved organic nitrogen (DON) contributes significantly to the overall nitrogen budget and can potentially be biologically available as a source of N. Despite this it is not routinely measured. This study found that DON contributed up to 10 % of the total dissolved nitrogen (TDN) found in precipitation and was the most dominant fraction in soil water (99 %) and stream water (75 %). In this paper we describe the development and application of a new web-based and open-source facility, UManSysProp (http://umansysprop .seaes.manchester.ac.uk), for automating predictions of molecular and atmospheric aerosol properties. Current facilities include pure component vapour pressures, critical properties, and sub-cooled densities of organic molecules; activity coefficient predictions for mixed inorganic-organic liquid systems; hygroscopic growth factors and CCN activation potential. In this manuscript we discuss observations of fluorescent aerosol and their interactions with cloud at a high-alpine site in the wintertime under background conditions. 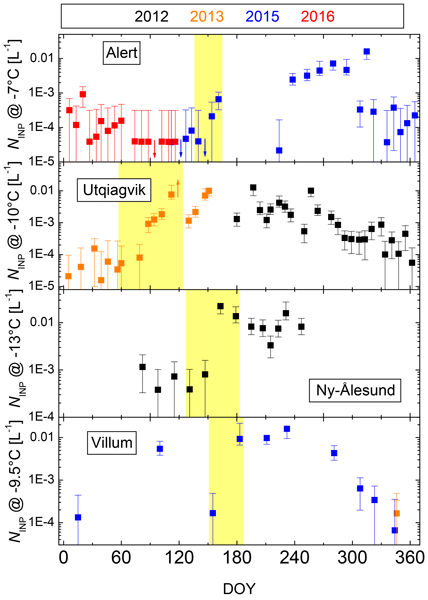 We find the majority of the fluorescent aerosol to be consistent in nature to mineral dust and no apparent trend was observed between the fluorescent aerosol fraction and meteorological or cloud microphysical parameters, suggesting that particle fluorescence does not impact cloud evolution or formation at the site. A significant portion of sulphate, an important constituent of atmospheric aerosols, is formed via the aqueous phase oxidation of sulphur dioxide by ozone. The rate of this reaction has previously only been measured over a relatively small temperature range. Here, we use the state of the art CLOUD chamber at CERN to perform the first measurements of this reaction rate in super-cooled droplets, confirming that the existing extrapolation of the reaction rate to sub-zero temperatures is accurate. We present details of an Aerodyne quantum cascade laser absorption spectrometer (QCLAS) used to make airborne measurements of N2O and CH4, including its configuration for use on board an aircraft. Two different methods to correct for the influence of water vapour on the measurements are evaluated. We diagnose a sensitivity of the instrument to changes in pressure, introduce a new calibration procedure to account for this effect, and assess its performance. HCA analysis methods were evaluated for the purpose of identifying primary biological aerosol sampled with a WIBS. The ward linkage with z-score normalisation could discriminate between five test particles with 98% accuracy. 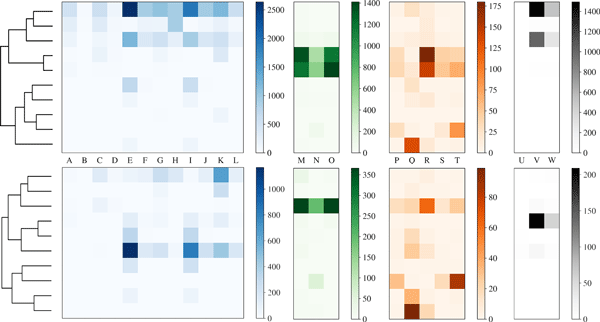 We applied these methods to a previously studied ambient data set, where both methods produced similar results with some minor differences in cluster partitioning. Finally we compared to previous approaches and found our new method offered improved quantification of PBA. 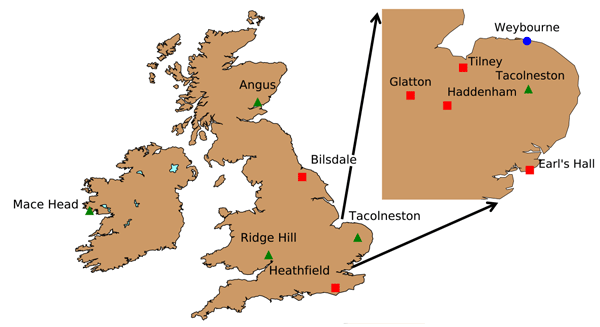 For the first time, the behaviour of non-refractory inorganic and organic submicron particulates through an entire annual cycle is investigated at a UK urban background site. We show secondary aerosols account for a significant fraction of the submicron aerosol burden, high concentration events are governed by different factors depending on season, and on an annual basis there is no variability in the extent of secondary organic aerosol oxidation. 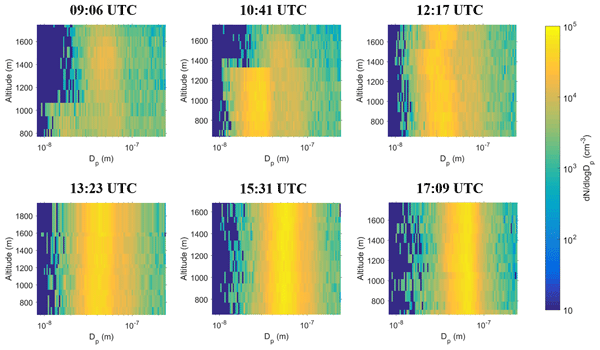 Measurements of cloud microphysics are reported from the Aerosol-Cloud Coupling And Climate Interactions (ACCACIA) campaign. Concentrations of ice particles from two spring and two summer cases are compared with particular attention to the role of secondary ice in these clouds. In addition aerosol measurements were used as input to a primary ice nucleation parameterisation which was compared with observed values of primary ice in these clouds. We found higher concentrations of ice during summer. Two solid fuel organic aerosol (SFOA) factors, both associated with domestic space heating activities, were derived from positive matrix factorisation (PMF) applied to organic aerosol data from an aerosol mass spectrometer (AMS) deployed at an urban background site in London during winter 2012. The factors controlling the split between the two SFOA factors were assessed, and it is concluded the split is likely governed predominantly by differences in burn conditions. This paper presents a validated method and data set for new retrievals of trace gas concentrations and temperature from the ARIES infrared spectrometer instrument on the UK Atmospheric Research Aircraft (www.faam.ac.uk). This new capability for the aircraft will allow new science to be done because of the way it can sense information about the atmosphere without having to physically pass through it (remote sensing). This will allow us to better understand the make-up of the lower atmosphere. This study presents airborne observations of particles, starting from 1.5 nm in diameter, above the boreal forest from 100 m up to 2700 m. The aim was to study the extent of NPF and likely places for nucleation. We found that the highest concentrations of 1.5–3 nm particles were above the forest canopy top on NPF event mornings, and the concentration decreased with increasing altitude. This would indicate the importance of gaseous precursors from vegetation for NPF processes in this area. A massive wildfire smoke episode impacted the western US and Canada in summer 2017. We measured CO, other trace gases, PM, BC, and aerosol optical properties at a heavily impacted, ground-based site affected by this event. Brown carbon diminished as smoke aged but was a persistent component of the regional smoke, accounting for about half of aerosol absorption at 401 nm on average. 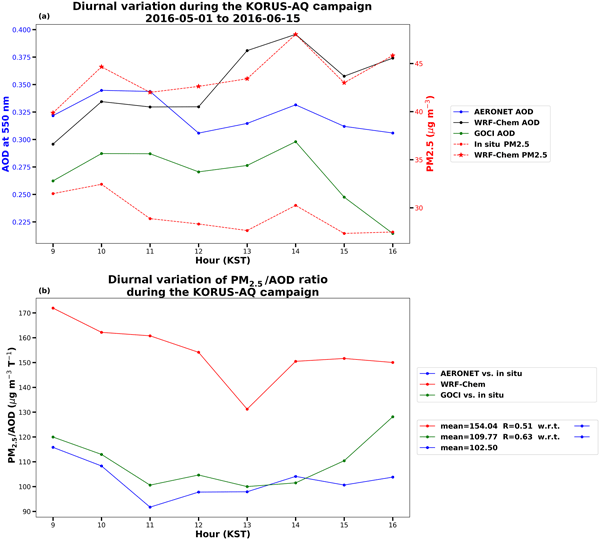 The PM / CO ratios suggested aerosol evaporation was dominant at the surface at smoke ages of up to ~ 1–2 days. Atmospheric black carbon (BC) particles are strong light absorbers that contribute to global warming. In situ cloud measurements performed at a high-altitude site showed that cloud supersaturation mainly drives the activation of BC to cloud droplets. It was further shown how BC particle size and mixing state modulate this nucleation scavenging in agreement with simplified theoretical predictions. These findings can inform model simulations towards a better representation of the BC life cycle. 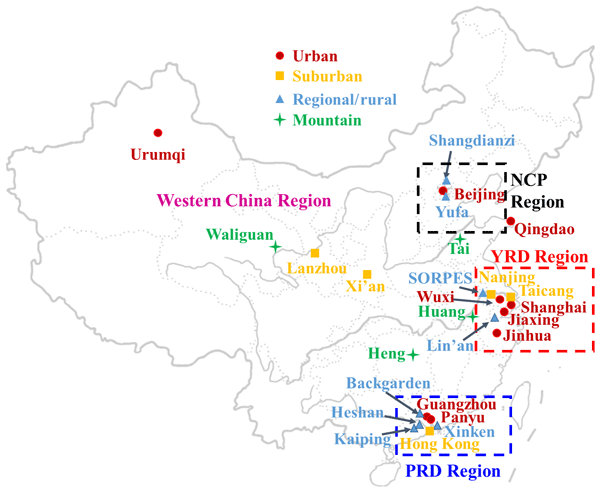 In various haze regions in China, including the Guanzhong Plain, the middle and lower reaches of the Yangtze River, the Pearl River Delta, the Sichuan Basin, and the Northeast China Plain, heavy aerosol pollution episodes include inter-/trans-regional transport stages and cumulative stages (CSs). During CSs a two-way feedback mechanism exists between unfavorable meteorological conditions and cumulative aerosol pollution. This two-way feedback is further quantified and its magnitude is compared. 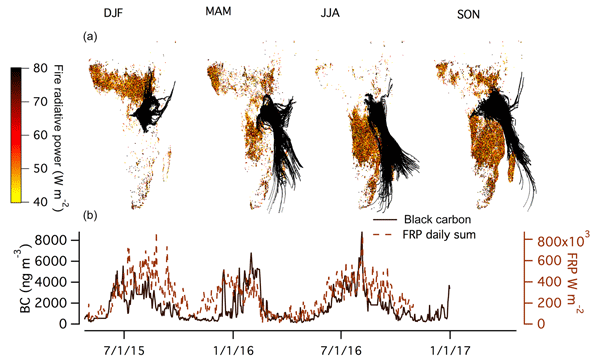 We assess the impact of air masses transported from the Po basin on the particulate matter (PM) levels in the northwestern Alps using multi-sensor observations from ground and space, and models. In this part 1 of the study, we investigate the phenomenon through three selected case studies representative of different seasons. 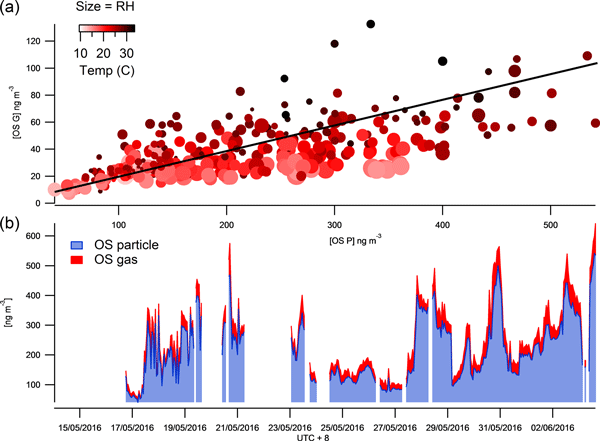 We show that advected aerosols remarkably degrade the air quality of the Alpine area (PM10 increasing up to >100 µg m−3) and we discuss the measurement–model discrepancies. This paper provides important insights on dust emission from sand dunes, which cover a large fraction of arid lands; produces the first in situ measurements for size-resolved dust emission from active sands that could improve the representation of dust cycle in climate models and remote sensing techniques; and shows that dust from active sands is likely significantly finer than thought, implying a greater effect of dust emission from active sands on downwind climate, hydrology, and human health. Aircraft vertical profiles of black carbon (BC) aerosol from the High Canadian Arctic have shown systematic variability in different levels of the cold, stably stratified polar dome. During spring and summer, efficiencies of BC supply by transport (often from gas flaring and wildfire-affected regions) were different in the lower dome than at higher levels, as apparent from changes in mean particle size and mixing ratios with CO. Summer BC concentrations were a factor of 10 lower than in spring. HULIS are widely distributed in atmospheric aerosol. Their sources are rarely studied quantitatively. Biomass burning is generally accepted as a major primary source with additional secondary material formed in the atmosphere. The present study provides direct evidence that residential coal burning is also a significant source of ambient HULIS in northern China based on source measurements, ambient sampling and analysis, and apportionment with source-oriented CMAQ modeling. Clouds form by condensation of water vapour on aerosol particles. We showed that black carbon, a subset of particles responsible for a climate warming due to their strong light absorption and known to be insoluble in water, were able to form droplets when the humidity of the air is very slightly over 100 %. This is made possible by their acquisition of a coating made of hydrophilic material during atmospheric aging. The predictability of this process using theory was successfully tested. 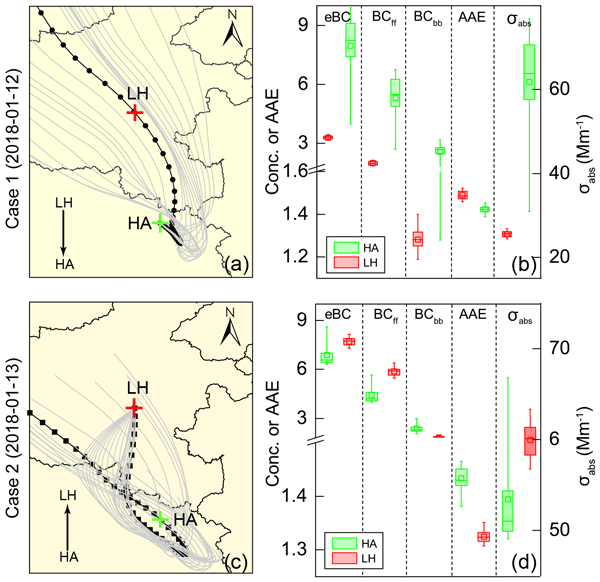 This paper reports the first airborne measurement campaign in the central Himalayan foothill region, one of the polluted but relatively poorly sampled regions of the world. The measurement campaign quantifies the vertical distribution of aerosols over a polluted mountain valley in the Himalayan foothills and investigates the extent of regional emission transport. Atmospheric aerosol particles were observed in Antarctica, at the Belgian Princess Elisabeth station during three austral summers. Possible source regions for the particles were examined. 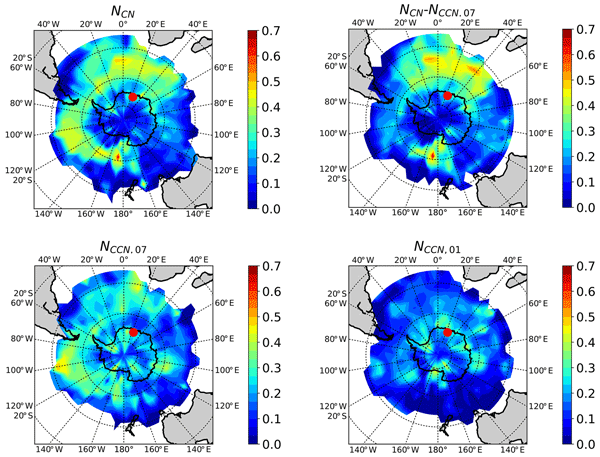 Air that spent more than 90 %; of the time during 10 days over Antarctica had low and stable number concentrations, while the highest (new particle formation) and lowest (scavenging and wet deposition) concentrations were observed for air masses that were more strongly influenced by the Southern Ocean. 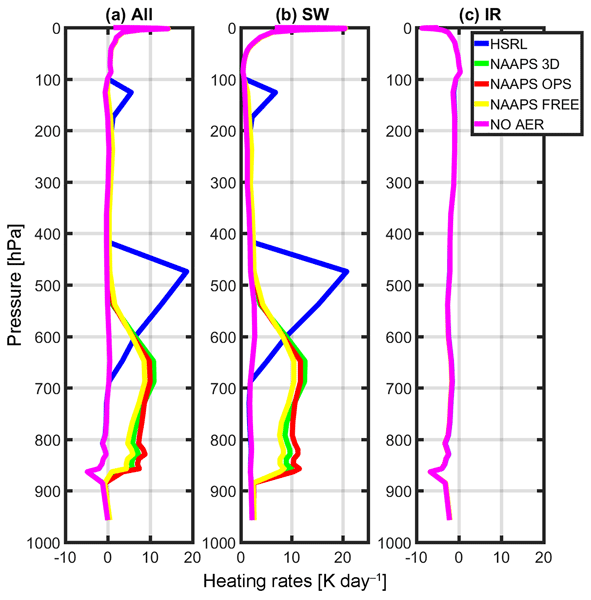 We conceptualized the aerosol radiative impact of an inline aerosol analysis field coupled with a global meteorological forecast system utilizing NAAPS and NAVGEM analysis and surface albedo fields. Model simulations were compared with in situ validation data collected during the NASA 2013 SEAC4RS experiment. Instantaneous heating rates peaked around 7 K day-1 in the lower part of the troposphere, while the HSRL profiles resulted in values of up to 18 K day-1 in the in the mid-troposphere. The characteristics of new particle formation (NPF) in China, including frequency, formation rate, and particle growth rate, were summarized comprehensively and were compared among observations in different environments. The interactions between air pollution and NPF are discussed, as well as the possible reasons for more frequent NPF under heavy pollution conditions than in our current understanding. Significant and future research directions for NPF studies in China are also summarized. 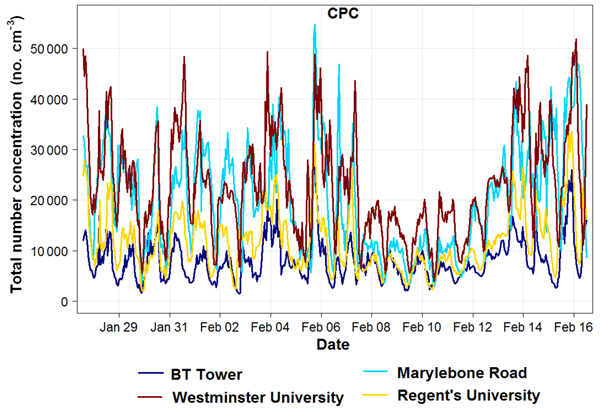 Particle number size distributions were measured simultaneously at five sites in London during a campaign. 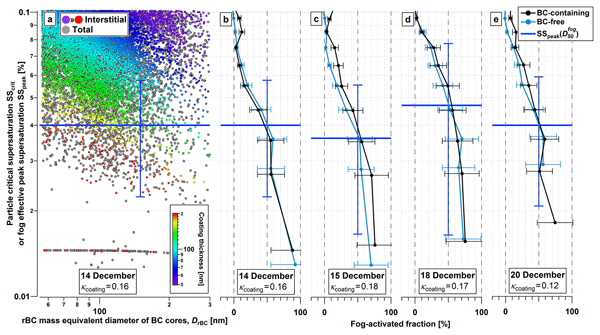 Observations are interpreted in terms of both evaporative shrinkage of traffic-generated particles and condensational growth, probably of traffic-generated particles under cool nocturnal conditions, as well as the influence of particles emitted from Heathrow Airport at a distance of about 22 km. The work highlights the highly dynamic behaviour of nanoparticles within the urban atmosphere. 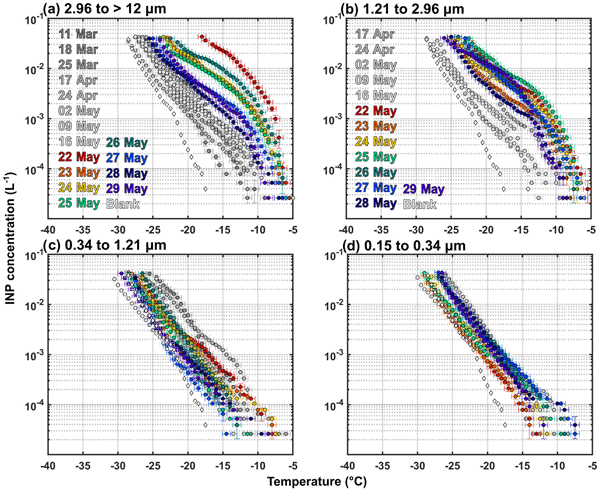 Warm-temperature ice nucleating particles (INPs) were observed during a springtime transition period of the melting of frozen surfaces in Northern Alaska. Such INPs were likely biological and from marine and terrestrial (tundra) sources. Influxes of these efficient INPs may have important implications for Arctic cloud ice formation and, consequently, the surface energy budget. 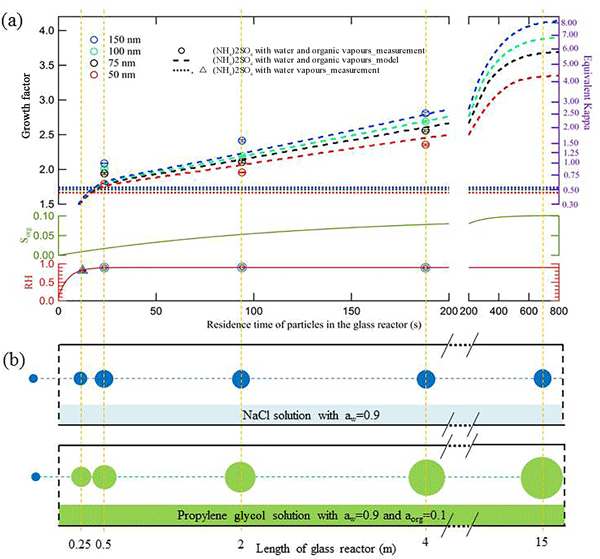 Our paper provides an automatic method to classify new particle formation events into four classes based on the accompanying air ion concentrations. The method is applied to 10 years of data measured within the SMEAR II station and was capable of eliminating the undefined class as well as defining the start, peak and end times of a regional event by monitoring the initial steps of cluster formation. Our method can be modified and applied to different locations where particle formation occurs. Scattering properties of the atmospheric aerosol were measured in the Sierra Nevada with a custom-built polar nephelometer; scattering coefficient, phase function, asymmetry parameter, and backscattered fraction have been derived. 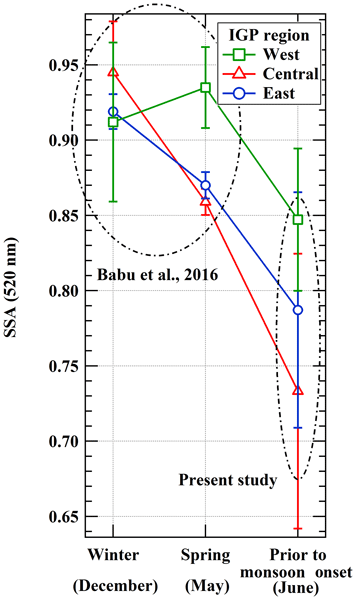 Phase function and asymmetry parameter of the Sahara aerosol differ significantly from the usual aerosol. The asymmetry parameter permits distinction between Sahara and non-Sahara aerosol. Gobi desert aerosol scattering is similar to that of the Sahara. Aircraft-based measurements of vertical profiles of aerosol properties, across the Indo-Gangetic Plain (IGP), prior to onset of the Indian summer monsoon reveal a highly absorbing aerosol system over the IGP. Aerosols over the west IGP are mostly natural, larger in size and scatter light efficiently. Those over the central and eastern IGP are mostly anthropogenic in origin, smaller in size and absorb more light. Elevated absorbing aerosol layers may modulate regional precipitation patterns. Here, we elucidate the key processes that drive marine boundary layer (MBL) aerosol size distribution in the eastern North Atlantic (ENA) using long-term measurements. The governing equations of particle concentration are established for different modes. Particles entrained from the free troposphere represent the major source of MBL cloud condensation nuclei (CCN), contributing both directly to CCN population and indirectly by supplying Aitken-mode particles that grow to CCN in the MBL. 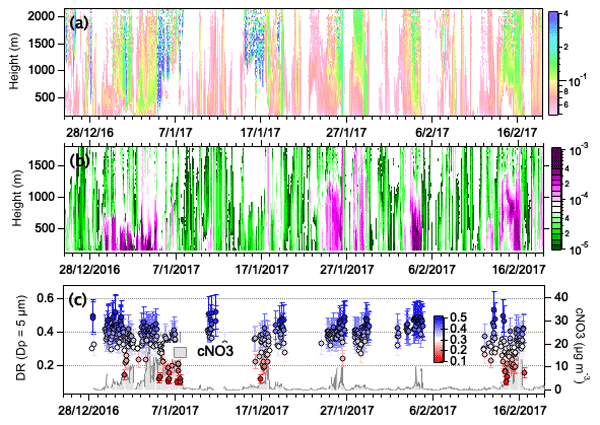 We study how new particle formation (NPF) events affect clouds throughout the year at a ground site in the E.Mediterranean. Using a new set of tools and evaluation metrics, NPF is found to affect only evening and nocturnal clouds by modestly increasing droplet number by 7 to 12 %. A conventional analysis based on CCN concentration at prescribed supersaturation levels (or aerosol size) can considerably bias the perceived influence of NPF events on regional clouds, hydrological cycle and climate. We conducted an extensive observational analysis involving 10 dust storms to assess the electrical properties of dust particles. Using wavelet coherence analysis, we found that the space charge density and dust concentration were highly correlated over 10 min timescales. 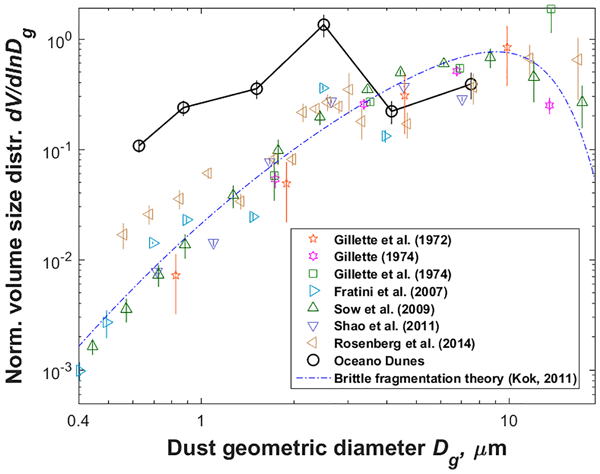 The significant linear relationship between space charge density and dust concentration at given ambient conditions suggests that the mean charge-to-mass ratio of dust particles was expected to remain constant. 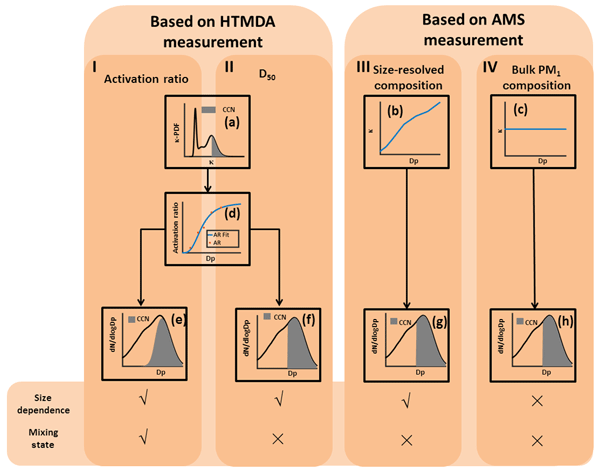 We report detailed lab-based performance evaluation of a robust hygroscopic tandem differential mobility analyzer (HTDMA), in terms of hygroscopic properties such as growth factor (GF) and the hygroscopicity parameter (κ). The HTDMA was deployed during a field campaign to measure the hygroscopic properties of aircraft engine PM emissions in the exhaust plumes from a CFM56-2C1 engine burning regular jet fuel, alternative fuels, and blends. 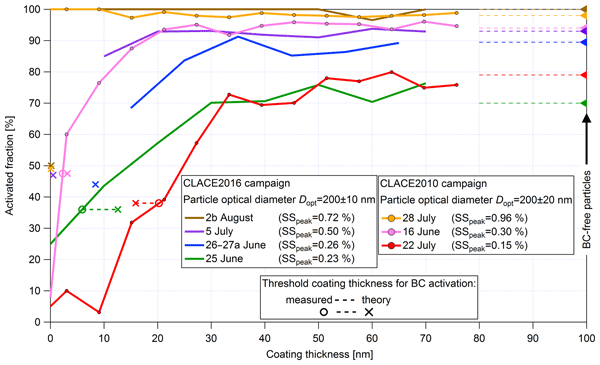 We report the direct field measurement of size-resolved mixing state, Eabs, and aerosol single-scattering albedo (SSA) at λ = 532 nm at a rural site in east China in summer. Parameterization of Eabs and SSA captures much of the influence of black carbon (BC) coating and particle absorption. The results show that absorption amplification depends on the coating thickness and the absorption of coating materials, and photochemistry plays role in modifying the absorption of BC-containing particles. The vertical distribution of new particle formation events was studied using tethered balloons carrying miniaturized instrumentation. Results show that new particle formation and growth occurs only in the lower layer of the atmosphere, where aerosols are mixed due to convection, especially when the atmosphere is clean. 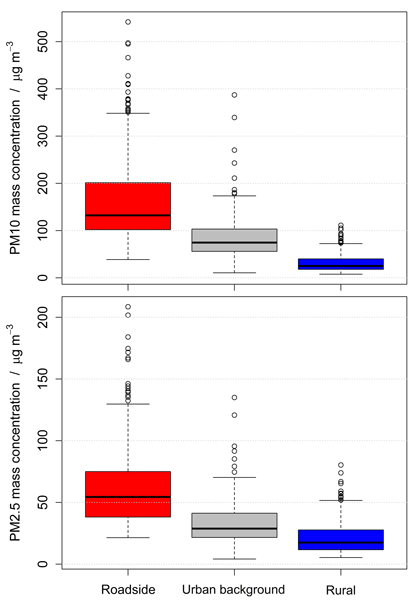 A comparison of urban and suburban surface stations was also made, suggesting that such events may have a significant impact on ultrafine particle concentrations in a wide area. 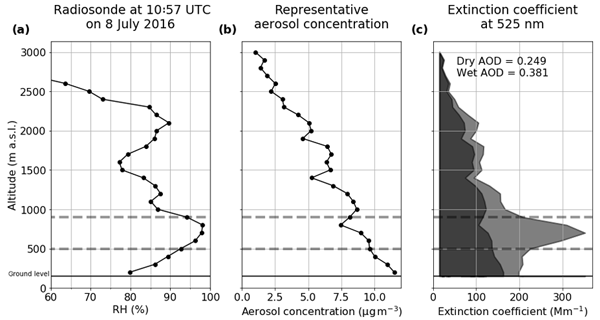 Significant influences of transport on measured aerosol size distributions are commonly observed. 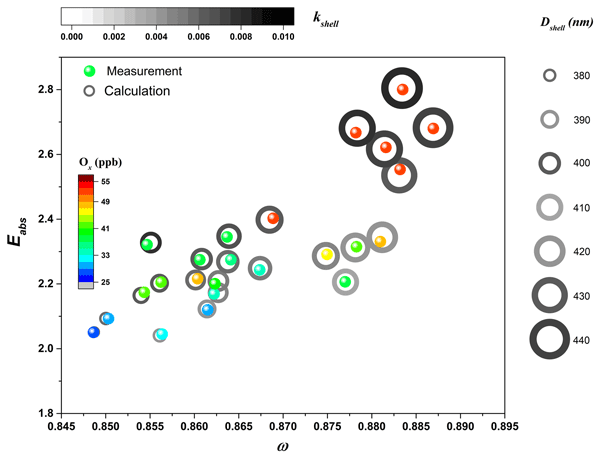 We propose a method for estimating the contributions of transport to nanoparticles during new particle formation events. 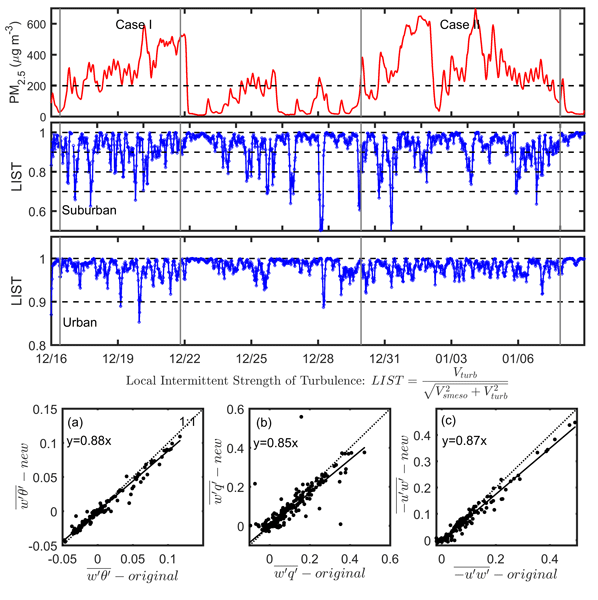 This method was used to analyze new particle formation events in Southeast Tibet, Fukue Island, and urban Beijing. The changes in the contributions of transport have a good correlation with the changes in wind speed and direction, indicating the feasibility of the method. Cloud condensation nuclei (CCN) play a critical role in cloud formation which affects solar radiation and climate. We employed advanced instruments to measure aerosol hygroscopicity and chemical composition and used them to predict CCN activity. Our results found that the CCN activity was largely dependent on the hygroscopicity parameter and the surface tension of the particles. Our study highlights the need for evaluating the effects of organics in order to accurately predict CCN activity. 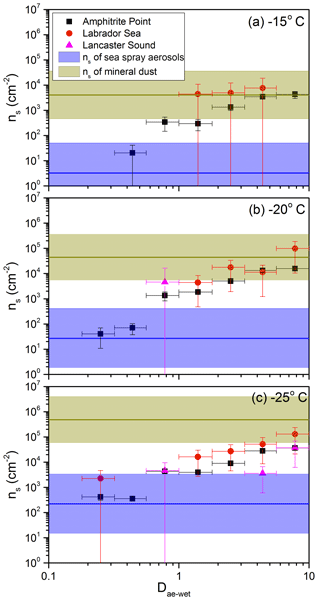 Using the concentrations of ice-nucleating particles (INPs) and total aerosol particles measured at three coastal marine sites, the ice-nucleating ability of aerosol particles on a per number basis and a per surface-area basis were determined as a function of size. The ice-nucleating ability was strongly dependent on size, with larger particles being more efficient. This type of information can help determine the sources of INPs and constrain the future modelling of INPs and mixed-phase clouds. Low- and middle-income countries face an increasing threat from poor air quality, stemming from rapid urbanization, population growth, and rises in fuel and motorization use. 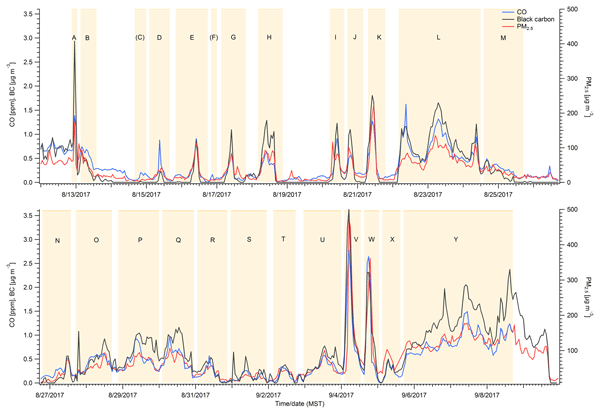 This paper presents high temporal resolution particulate matter (PM) data, using low-cost sensors, for the exemplar city of Nairobi, Kenya, where PM levels are found to be much greater than WHO recommendations. The study shows that calibrated low-cost sensors can be successfully used to measure PM in cities like Nairobi. Organic aerosol components (OA) take account for 20–90 % of submicrometer aerosol mass and have a broad distribution of hygroscopicity. For the first time, the diurnal variation and size-dependence of the hygroscopicity of OA were characterized for a forest in East Asia. The observed variation and dependence were assessed from the viewpoint of biogenic secondary organic aerosol formation, and they strongly affected the contribution of OA to the CCN number concentration. Atmospheric aerosols have diverse effects on air quality, human health, and global climate. One important source of aerosols is their formation via nucleation and growth in the atmosphere. We have analyzed long-term observations of regional new particle formation events around the globe and provide a comprehensive view on the characteristics of this phenomenon in diverse environments. The results are useful in developing more realistic representation of atmospheric aerosols in global models. In this manuscript, we provide the results of the hygroscopicity of a more anthropogenically influenced aerosol in a suburban site in China. 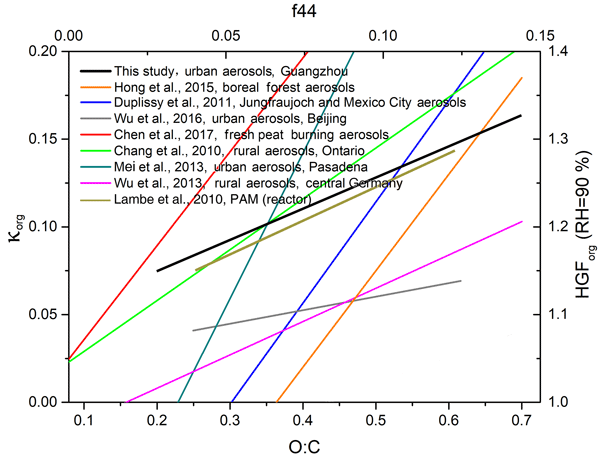 Organic material in the current type of aerosols showed moderate hygroscopicity, and it appeared to be less sensitive towards the variation of its oxidation level, which suggests different characteristics of the oxidation products in secondary organic aerosols (SOA) under the suburban/urban atmosphere in China when compared to other background environments. The research community aims to quantify the actual contribution of soot particles to the recent Arctic warming. We discovered that mixing of soot with other components might enhance its light absorption power by 50 %. The neglection of such amplification might lead to the underestimation of radiative forcing by 0.12 W m−2. Thus a better understanding of the optical properties of soot is a crucial step for an accurate quantification of the radiative impact of soot in the Arctic atmosphere. The harvesting of crops emits large amounts of particles into the air. These particles can form and interact with clouds to alter cloud properties and precipitation, but the magnitude of these effects is unknown. This study looked at the ability of harvest particles to form ice in clouds by sampling with an ice nucleation chamber downwind of fields being harvested. Some crops emitted large amounts of ice-nucleating particles, and harvest emissions are mixtures of organics, soil, and minerals. Under the effects of the Tibetan Plateau, dry low-pressure systems are often formed at 700 hPa in the Sichuan Basin, China, during winter. 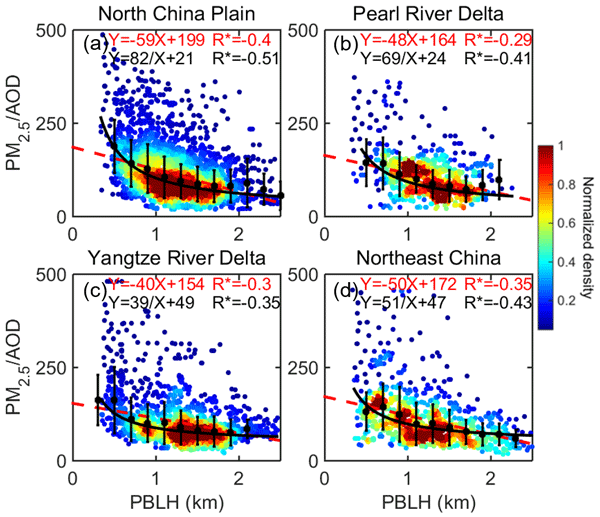 Here, we found that the activities of these dry low-pressure systems have significant influence on most winter heavy air pollution events in the Sichuan Basin. Influencing mechanisms have been summarized. 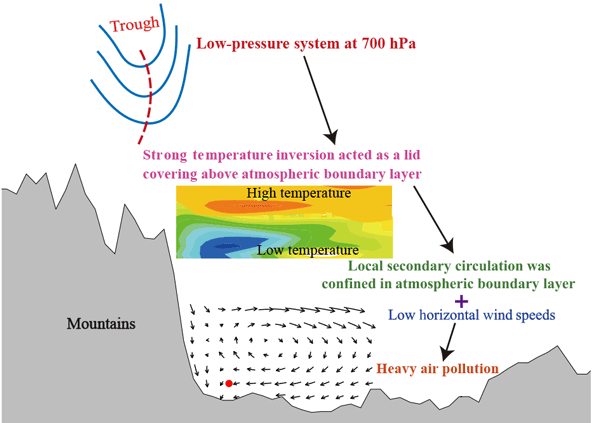 The strong inversion layer above the atmospheric boundary layer induced by the low-pressure system plays a key role in the formation of heavy air pollution.